Paramhansa Yogananda told a story about Trailanga Swami in his book, the Autobiography of a Yogi’. The swami was well known in India for his miracles. One day, a man tested him by offering him poisoned milk. As soon as the Swami finished drinking the milk, the man fell to the ground in pain. 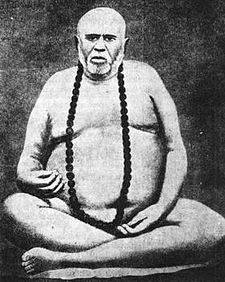 He cried out, “Swamiji, please forgive my wicked test. My stomach is burning!” The swami reprimanded the man, “Had I not realised that God is in my stomach, I would have died!” The Swami then healed the man of the karmic consequence of his evil action. Yogananda explained that a man with Trailanga Swami’s realisation is able to manifest the karmic consequence of an action immediately. Had the man not suffered immediately, he would not have been able to connect his actions with the consequence of his action when the karmic seed eventually ripen. He may have died from it. In most cases, we cannot connect our actions with their consequences because of the time gap between them. Even if the time gap is small, it is still difficult to connect the two and even if we can, most of us will dismiss it as a coincidence. When I was young, I could see the karmic consequences of my actions. I used to go fishing with my uncle when I was young. I enjoyed it but later, when I saw the fishes struggling, I felt very guilty and sorry. Later I fell very ill and could somehow see the connection with the fishing incident. Other events happened in a similar manner which helped me inculcate a strong conviction in the law of karma. The law of karma is not meant to scare us into doing something good. Understanding it can free us from unnecessary mental suffering. It helps us to naturally and effortlessly forgive others for hurting us because we know that the justice meted out by the Divine is infallible. My friend Peter shared his story with me, “I lent money to a colleague to help him because he told me that his mother was sick. Later, I found out that he lied to me. He had the habit of borrowing money and not paying it back. Obviously, money was more important to him than a friendship based on trust. I asked him a few times but he refused to repay the loan. I could have arranged for the Human Resource Department to deduct his salary but I just decided to write-off the debt because I know that the money will come back to me some way or another”. Had Peter held on to the hurt of being lied to, he would have harboured unnecessary anger in his heart. That anger will continue to build and eventually, his loved ones may have to suffer his foul mood. Fortunately, Peter was wise enough to prevent that from happening. He was able to see pass the veil of ignorance created by the ego. The law of karma is not meant to punish but to show us the road to Divinity. It is not meant to scare but to help us inculcate love within us. Without anger and hatred, our life will be filled with love. So, let us not be fooled by this illusory play of the ego. Let us live in reality and maintain our inner calm and peace. Sometimes, the Divine needs to put on the mask of our enemy in order to lead us out of a greater misery.